It’s Food Fact Friday. On this day, I reveal an interesting food fact. Today, we’re learning about garam masala. Much like turmeric, garam masala is also a staple in Indian households. Garam masala is a combination of pungent spices and the name derived from Hindi means “hot mixture.” This blend of spices is common throughout India and most parts of Southeast Asia and each sector has its variation on the blend. If you don’t want to grind the spices yourself, it is also sold commercially at most foreign spice stores. The common blend of garam masala contains the following ingredients: black and white peppercorns, cloves, black cumin, cumin seeds, malabar leaves, cinnamon, cardamon, nutmeg, star anise, and coriander seeds. The mixture of spices is ground together but not roasted. Garam masala tastes best when fresh spices are ground together. Be wary of commercial mixtures. You never know how they are prepared, how long they’ve been sitting on the shelf, and given this unique blend of spices how well they’ll do in your dishes. 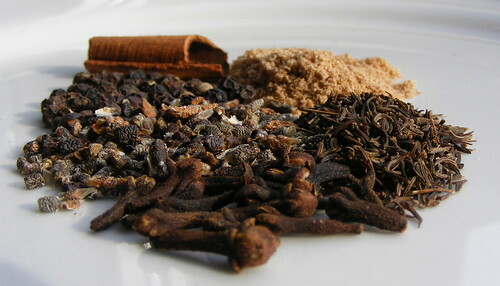 Garam masala is used in Indian curries, raitas (yogurt dish), and sabji’s (dry dishes). Given the pungent taste, be careful when adding this spice and test it often to ensure its flavor. A little goes a long way with this mixture given the consistency and variation of garam masala however if you used properly, it can be a wonderful addition to your dish.